Home » Lips » Lipbalm » Lend me some Fresh Sugar Lip Treatment, I’m your neighbour! Lend me some Fresh Sugar Lip Treatment, I’m your neighbour! I don’t use lip balm. Does that shock you? It shouldn’t. It’s the reason why I hardly ever talk about lip balm here on my blog. I don’t believe in it, but then I don’t believe in a lot of things, like delusional people, romance novels and organic food. But I don’t deny that there are times when you need a lip balm. When your lips feel chapped, the worst thing you can do is pick at the dry flaky skin, and lick your lips. In those (rare) situations, I turn to a product I’ve kept on hand for this purpose. 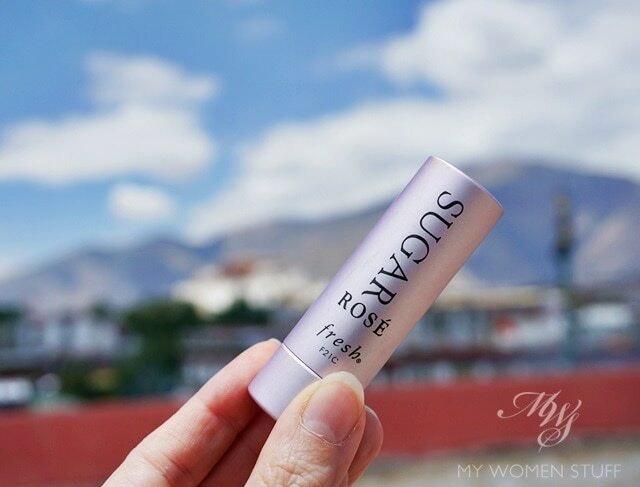 It’s the Fresh Sugar Lip Treatment SPF15 which I own in Rose. I’ve had this one for a while to be honest, and I picked it up at Sephora one day, a long while ago, because I was curious. The retail price was RM65 back then (now RM84) which puts a huge ding in your wallet for something as inconsequential as a lip balm, but I just had to try it la… you know how it is right? Scratch that itch and it’ll go away. This is my first Fresh product, and I must say that I like it. I like how the case screws shut. It prevents the cap from going off on its own jaunt and exposing the balm to all sorts of lint and gross mess. As a balm, I like that the Fresh Sugar Lip Treatment does not leave a waxy film on my lips the way a lot of lip balm do. It glides on, leaving a layer of slightly oily wax over my lips, which gives lips a nice glossy shine, but does not leave that weird feeling of having rubbed candle wax on your lips. I do find that the product is a little soft in warm or hot weather, but in cooler weather, it firms up a little more. It still doesn’t harden up into a candle, for which I’m very happy. I detest having to rub at my lips with a chapstick over and over, only to feel like there’s nothing on my lips. While these come in an untinted version, mine is in Rose which imparts a slight rosy tint to the lips. Not a lot of colour, but on days when I wear a lipstick that stains, I like to refresh the colour in the afternoons with this one. It adds a bit of shine and gloss to the lips and a hint of colour, which when blended with a stain, looks lovely! So I’m happy I own this, and if you ask if I’d recommend it, I’d say yes because it functions well without making my lips feel weird and waxy. But because the price is so steep, I’d tell you to sleep on it. If you use lip balm daily, every hour on the hour, like it’s going out of style then this will bankrupt you. But if you use it just occasionally as I do, then this is a nice treat for your lips. 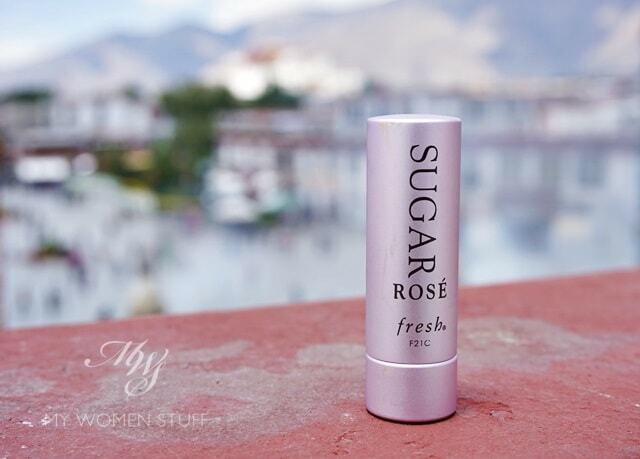 The Fresh Sugar Lip Treatment SPF15 is what I’d call a luxury lip balm. It’s pricey but I like how the texture feels comfortable without feeling like I’ve layered a thick layer of wax over my lips. It also seems to treat my lips on top of helping them stay chap-free when it’s dry or when my lips feel dry. It comes in a tinted and untinted version but the one featured here is tinted a slight rose. It doesn’t impart a lot of colour, but it gives a nice hint of colour to the lips for when you need it. I like this a lot, but the steep price can be off putting for many. If you’re feeling flush then this might be something to indulge in. Octinoxate (Ethylhexyl Methoxycinnamate) 7.49%, Oxybenzone (Benzophenone-3) 2.00%. Cera Alba (Beeswax), Ricinus Communis (Castor) Seed Oil, Simmondsia Chinensis (Jojoba) Seed Oil, Hydrogenated Olive Oil Decyl Esters, Vitis Vinifera (Grape) Seed Oil, Parfum (Fragrance), Copernicia Cerifera (Carnauba) Wax, Persea Gratissima (Avocado) Oil, Limnanthes Alba (Meadowfoam) Seed Oil, Ribes Nigrum (Black Currant) Seed Oil, Helianthus Annuus (Sunflower) Seed Oil, Rosa Damascena Flower Water, Retinyl Palmitate, Ascorbyl Palmitate, Ascorbyl Tetraisopalmitate, Tocopherol, Sucrose Tetrastearate Triacetate, Ci 15985 (Yellow 6 Lake), Ci 77891 (Titanium Dioxide), Ci 15850 (Red 7 Lake), Polyglyceryl-3 Polyricinoleate, Ci 77491 (Iron Oxides), Ci 77499 (Iron Oxides), Propyl Gallate, Limonene, Benzyl Alcohol, Linalool, Bht, Citral, Citronellol, Geraniol. Have you tried a Fresh Sugar Lip Treatment? Would you pay more for a lip balm? I think this product is one of Fresh’s most popular products and having tried it, I can see why. It’s good and my lips love it. It has also made me curious about trying the other highly raved products from Fresh but gosh, they are pretty pricey aren’t they? PREVIOUS POST: Your Say: What are your inflight beauty essentials? I love Fresh sugar lip treatment. Been using their range for a while now. I no longer have chapped lips. 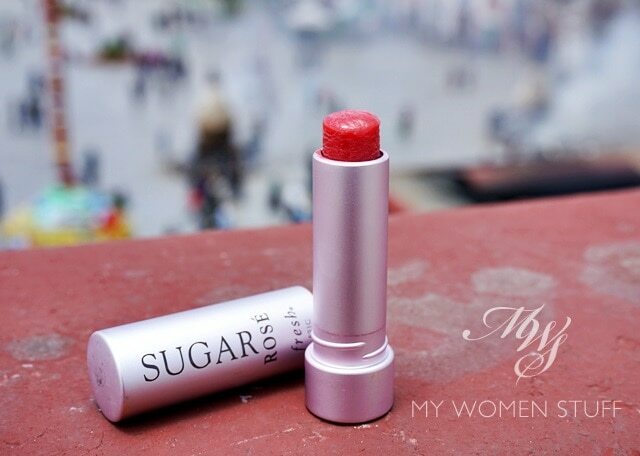 Be careful about carrying this fresh sugar lip balm though, I carry it during summer in the United States, it melted in my bag. Since then i carry a small inside my bag to carry all my lipsticks to avoid staining my bag. Yikes! So many complaints of it melting! :O I’ll be sure to take special care, thanks for the tip. I don’t experience it melting here though even in our hot weather. I wonder why. I never quite got the hang of Lip Glow LOL I liked it I remember, but I kept treating it as a makeup item and I suppose it didn’t help that I don’t use lipbalm regularly LOL! But yes, it’s nice and I suppose it counts! i have these in several colors. the higher the pigment or darker colors. the less moisturizing it is. And the weird part about this lipbalms…it melts… Not in every pc. but i encountered it in my Tulip & Berry colored one. and my sis encountered it in Rose. So u have to be extra careful and not lay them around near too much heat. Thanks for letting me know about the pigment-moisture ratio! You know what, speaking of melting, so many other readers are also warning about it melting! I noticed that it sometimes is a bit soft, but I don’t actually experience any melt even in our weather. Now I feel a bit left out LOL! I have this too, but in the non-tinted version. It is amazing, and I love the taste of it as well! The little lip scrub is wonderful too. I have the same one and I love it! I think I’m a hell lot more intrigued by the screw packaging than the actual lip balm. But I still think the lip balm rocks. I’ve since gotten smaller tubes of the rest. The smaller ones are really cute! Haha yes I love that it screws shut. I especially hate those lip balms that have little caps, you know like Chapstick? They always fall off and go missing and if I keep it in my coat pocket it comes out covered in lint! YUCKS! I don’t use lip balm either except if I get a cold. Then my lips get all sad and I need one. I haven’t tried the Fresh lip treatments as I remember a friend mentioning hers melted in her handbag! I also want to ask if this bears any resemblance to Dior’s Lip Glow? I love their Sugar Lip Polish. Probably one of my favorite lip scrub out there, although the hefty price made me think twice to replenish it after I’m done with the current pot. It’s made of brown sugar crystals but it doesn’t feel rough on the lips, unlike other brown sugar lip scrub I’ve tried so far. It scrubs AND moisturizes the lips at the same time! LOL Yes Fei, my sceptic tendencies are showing in a big way! 😀 I’m glad it doesn’t put you off 😉 Sorry to hear the tinted version didn’t work for you 🙁 I’m hearing so many love-hate stories about this lipbalm right here in the comments and it’s confusing me! I now wonder if I just got really lucky with a non-melting, moisturising version of this Fresh lip balm LOL! I’m a regular user of lip balm , and I absolutely hate these from Fresh! It smelled and tasted horrible ( like burnt plastic!!!) and it turned so soft when I onced leave it near to my MacBook! I have purchased twice before ( the stupid me thought that maybe the first time round, I bought the wrong colour, thus the nasty smell. So I bought another new one to try. MAJOR DISAPPOINTMENT!) I think those $2 lip balm from petrol kiosk works better than Fresh! That price for a lip balm is rather (too) steep for me. Considering that I toss my lip balms all over my handbag/sports bag/cosmetic pouch/bag bag. I am (currently) a total fan of Rachael Roy’s EOS series for a daily lip balm. Would you believe that my 12 year old daughter introduced that brand to me? Between the 2 of us, we have easily 7 to 8 flavours. The little colored spheres are cute and easy to carry. And it works in that daily use keeps the lips soft and non flaky. And this is coming from one who was perpetually with flaky lips. and have replaced my previous favourite, the Kiehls intensive lip treatment. But I would have to say that the most effective for me emergency cure for cracking, dry and flaking lips is still Lucas Paw Paw. I’ve graduated from having just a tube to having an entire pot on my dressing table for any emergency use. It really works overnight. I do use lipblam regularly but I wasn’t really all that impressed with this one, particularly as the price was pretty steep for what it offered. If it was a lip balm + a bit of colour product, Burts Bees offers a nice one at a much better price. I saw some Burts Bees ones and they looked cute too! Much more pigmented too, for those who want more colour 😀 Glad to know it’s nice too! I don’t use lip balm just because I hate the waxy texture. I have the exact same Sugar rose lip balm but I find myself reaching out to Dior’s lip glow and Benefit’s tinted lip balm more often. Do give those a try if you have the chance! When it comes to lip balm, I’m a believer. But then, the cold winters here make it a necessity. Nuxe Reve de Miel (in the pot) is my best friend. I hate candle wax lip balms too! But the Nuxe and Burt’s Bees tinted balms are lovely and soft. I LOVE Fresh Sugar lip treatment! It’s the first ever lip balm I’ve ever finished..not sure if it’s because of the price tag that my heart and brain forced me to finish using it. ???? Haha! Hahaha that crazy price tag is as good a reason as any to make you finish the lip balm! It’s a lovely product to have but I really dislike it in summer when it literally melts in the tube. Strictly for cold weather conditions. Goodness, I just realised how lucky I am you know. I experienced it going a bit soft, but not actually melty. But yes, in cooler weather, it’s definitely lovely!